In the hope of encouraging LBM into baking, I bought a Betty Crocker Red Velvet cake mix. Shock-horror, I hear all you die hard baker followers tut. But I wanted something nice and easy that didn't matter if it all went a bit wrong. LBM didn't actually give a flying noodle that we were making a cake....until I turned the mixer on of course. The whirr of the beaters is very intriguing for a toddler, you know. But the fascination soon wore off and he headed back to playing with his buggy. His pink toy buggy. It's the only one they had, I find myself explaining to LRUN. Honest. The cake rises well but I will admit, I was a bit dubious about tasting it. But you know what...add a couple of thick sumptuous layers of my own vanilla cream cheese icing and it was actually pretty yummy. I wait patiently each day for the postman to come hoping he will deliver one very much needed police check. But sadly nothing. Endless spare parts for LRUN's money pit on our driveway but sadly no DBS form. Time is ticking on and so with the risk of offending, I email Miss Delia asking politely if I should be chasing this form or is she 'on it'. I get an instant reply but it's an out of office one as usual. A few more days pass with no surprises from the postman or emails from Miss Delia and I begin to worry. I eventually call Miss Scarlett, LBM's social worker and she tells me to phone up and chase it. "Do you have the number?" she asks. So....at what point has this paperwork malarkey become my problem? I call but am told they will not pass the information on to me. They need to speak to LRUN himself or direct to social services. The DBS man asks when the hearing is and as I tell him, he takes a sharp intake of breath saying we really don't have much time, confirming my fears. LRUN is in meetings all day and I am severely tempted to call back putting on my deepest manly voice possible but quickly pass that off as a stupid idea. It will have to wait until Monday. So, it seems this has now become our problem. Nice. But to sparkle things up a little, I thought I'd share some good news with you for a change. I'm in print! My ChoccyNuttyNana recipe has been featured in the Adoption UK cookery book, which you can purchase here. It's only a teeny achievement but it's an achievement none-the-less and it feels ace. So here we sit on the eve of LBM's court date for the adoption order. The champers is in the fridge chilling. Ready. I wish I could say we had a celebratory restaurant booked but with no grandparents nearby, meals out are a thing of the past. I think back to the last 2 years. How long and often agonising this process has been. I can't quite believe that that little champion asleep upstairs will tomorrow finally be legally ours. Here's hoping of course it will be as straightforward and sure a thing as a vanilla cupcake. Surely Tummy Mummy won't appeal. Surely the birth father won't suddenly decide he does want to be a part of this. Surely? I talk myself out of worrying and go back to browsing tray bakes on Pinterest. Miss Delia says she will call me as soon as she has news. I make a mental note to keep busy tomorrow. And another to actually turn my phone on. My phone rings early. I am driving and have to pull over to call her back. Her voice sounds trembly and I sense a problem. There is. She asks if we have received our police check forms back. "The ones we had to do last year but because your process takes so long, they have expired and we now, like everyone else, have to renew them. Those ones?" I want to say sarcastically but resist. No, LRUN is still waiting on his, I explain. And then my friends, she drops yet another bomb on us explaining that they cannot grant the Adoption order without it. I am speechless. At no point was the importance of this form mentioned. She makes me feel like it was my fault for not alerting her to it but I honestly believed we just received copies and that they held the originals. She is the paper pusher and I am the parent, right? Right? I curse myself for actually allowing myself to relax and take a back seat with this last hurdle, presuming they had everything under control. And so once again, we face another delay and the order has been delayed another 3 weeks. Hashtag irritated. Forget the champagne... Pass the gin. What a difference a couple of months make. We make another trip to the zoo, this time to meet up with my saviour, Triple A and her little one. LBM is literally running around and loving every minute of it. Ok, so he is still far more fascinated by the local pet chicken making a nest under our lunch bench than the exotic Sun Bears but he is happy. I even manage to get him to fall asleep in the car, admittedly only for 15 min but this is a huge step for us. It appears that power naps work just as well for him as his usual marathon afternoon sessions. He has just learnt to walk backwards and is incredibly proud of his new found moon walking skills. This together with staring at himself in the mirror, lifting his ever so slightly 'Jilly Cooper Horsie' polo shirt and patting his tummy as if it's a six pack, are his new found loves. It frustrates me when strangers ask how old he is. I want to say, "Oh somewhere between 1 and 2" but feel perhaps this is perhaps a bit tasteless. But the truth is, I want to parent him for who he is and where he is right now. And not what is expected of him. Over the last few weeks, I have been channeling all my woken energy into keeping this little guy happy. Most new mums are physically shattered. I am taking a hit on a more emotional and mental level. It's tough and LRUN senses it. Our evenings are quiet. As long as you ignore the tinkle tinkle of the ice cubes in the G&T's. Tummy Mummy has returned to the nearby seaside town. Thankfully social services actually remember to update me this time. But I have a date to meet up there with Miss Shaka Zulu and we go anyway. I will admit, while wandering around the aisles of the pound shop, I do realise I am seriously tempting fate here. It's the Adoption Court Order in a couple of days. I can't help but wonder how she is feeling. In the words of a very wise friend, parenting is not for sissies. We are into crisis management here. The last few months, LBM has been so miserable and I have found this pretty disheartening. Right now, we need to work on improving our relationship and just get the little guy happy again before I actually end up buying shares in Bombay Sapphire. A lot of it is frustration, as he is not talking and gets annoyed when we simply just don't 'get it.' Routine, routine, routine I hear the gurus chant. But it's a tough call, as I felt strict routine was only making things worse as boy do you pay if you accidentally change something. And I am not talking biggies here. So I throw in a few gentle curve balls and hope for the best. It seems to help. This week I have also been letting LBM do all the things he knows and loves. He is happiest out and about with us and the dogs, jumping in mud puddles. Or at home with food and familiarity. Any sort of social situation at someones house where he decides he no longer wants to be (usually after 20min) turns him into something out of Monsters Inc. This is hard to manage. He's got to get used to it but at the same time, we just want him to be happy. When things are getting a bit too 'Is it too early for a gin?' I have to keep reminding myself how far we've come. Watching him reach out to LRUN for a cuddle on the weekend, I had a huge lump in my throat. Baby steps I whisper to myself. Baby steps. It really helps when I just try and view things from his little world. He is still not hugely interested in his toys. In fact, his best friend is currently, Miele, the hoover. Following a close second are the car keys, MY toothbrush and Iphone. Oh and hours of entertainment with my sock as a puppet. His adoption court order is coming up in the middle of this month. We don't attend, only the birth parents do. I have faith they will grant us the parental order but you cannot be too sure in this crazy adoption world. Miss Delia is doing the prep and calls to asks me for my height for the report. Is this important? Blimey, are they monitoring our centiles too now? She explains they no longer put photos in the report, only descriptions. In that case, I tell her I have lost weight since she last saw me. She laughs. She says she had described me as slim build. Well I never. Now that really is a first! I must make room for more cake. 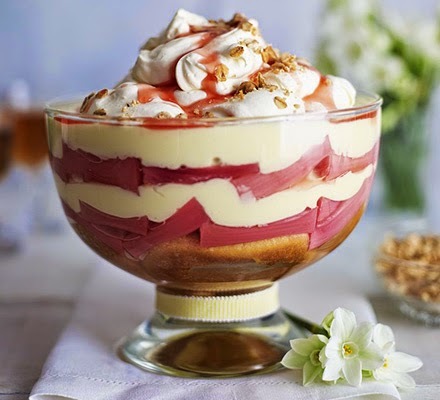 Or maybe a Rhubarb Trifle. Bloody love trifle.